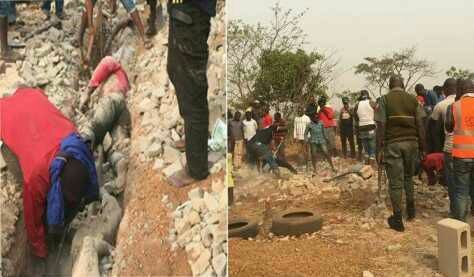 Nigeria’s Pulse.ng newspaper reports that Shallow graves were discovered with three decomposing bodies under the foundation of a church in Enugu State. The strange discovery of dead bodies discovered buried in shallow graves under the foundation of a popular church located at the Ugwuaji area along the Enugu-Port Harcourt Expressway, Enugu State, has caused serious outrage with residents vowing to lynch the General Overseer of the church who is now on the run. The corpses were found buried under the foundation of the church building, totally covered with concrete. It was learn that the construction of the building which commenced recently, and was at the foundation level before the gory discovery Monday, by one of the workers at the site who heard about the incident and discretely informed security agents who stormed the place and supervised the exhumation of the decomposing corpses.